Predictability. That's what HHI was looking for in a Drupal partner when they came to us. They needed an agency that could take over an extremely complex website with very precise business process needs. 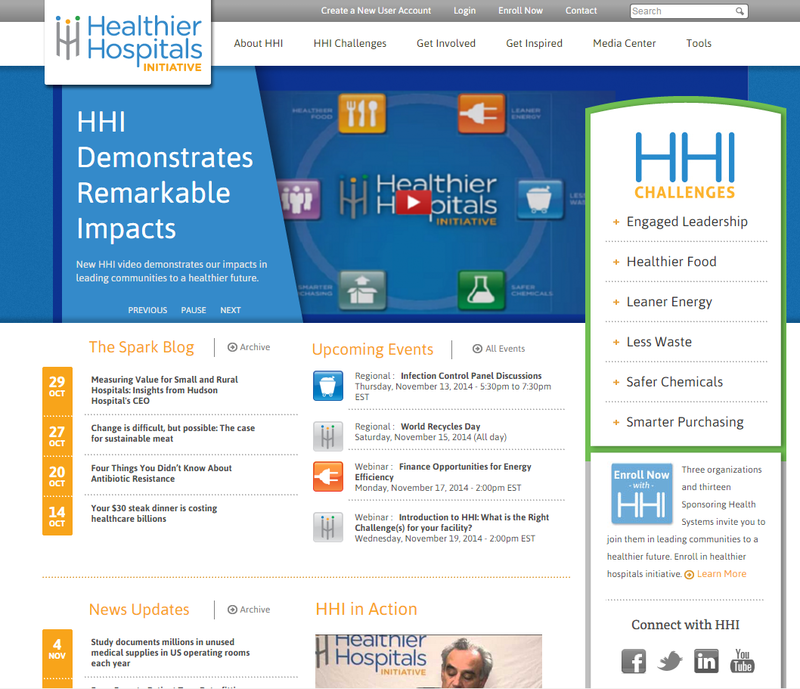 The Healthier Hospitals Initiative collects and tracks green initiatives in medical facilities across the United States and Canada. HHI staff had a long list of features that needed to be added to the website, and were struggling with high development costs and an unstable system. Our goal was to manage this large development effort while improving stability and security of the website. Without any documentation available for the original site, we conducted a business analysis and a technical analysis. We then worked with HHI to prioritize a set of nearly three dozen technical and functional site improvements, including visual enhancements, geo-coding and mapping, an event calendar, and streaming video. SoH also reconfigured the HHI hosting environment for significantly improved response time and security. SoH redesigned the system and hospital workflow, registration process and reports. In order to participate, facilities need to be registered with HHI and complete a complex web registration form. The workflow did not match the business process requirements, so we completely redesigned it to be more effective and efficient. The registration includes email notifications at each stage of the process; the ability for users to keep their profiles updated; and data reports and extracts to aid in tracking of contacts and participation. ©2004-2019 All content and images. Sleight-of-Hand Studios LLC. All rights reserved.